Over the past years, firmly grasping Party line on “developing a contingent of teaching staff and management cadres in line with innovative requirements for education and training, and promoting a standardized pool of teaching staff in conformity with educational levels and training skills”, the Signal Officers Training College has concentrated on building a contingent of comprehensively strong teaching staff as a basis for enhanced quality of education and training, meeting requirements for the military building in the new situation. Signal Officers Training College (also known as Telecommunications University) (hereafter the College) is a centre for training not only signal staff officers for the Vietnamese People’s Army, the Laos People’s Army and the Royal Cambodian Army, but high-end human resources in Information Technology (IT) and Telecommunications and Electronics to the cause of national industrialization and modernization. In addition, it is also a centre for scientific research and technological application and transfer; for the military IT and foreign language training, and for defence and security education in the Central and Western Highlands regions. In the face of overwhelming odds, the College has thoroughly perceived and properly implemented higher authorities’ resolutions on education and training and military building, especially Resolution No. 86/NQ-ĐUQSTW, dated 29-3-2007 of the Central Military Commission on the work of education and training in the new situation; Resolution 769/NQ-QUTW, dated 21-12-2012 of the Central Military Commission on “building a pool of military cadres in the 2013-2010 period and beyond”; Resolution 29/NQ-TW, dated 4-11-2013 of the Central Committee on “fundamental and comprehensive innovation in education and training, serving industrialization and modernization in a socialist-oriented market economy during international integration” of which building a contingent of teaching staff is considered to be the breakthrough task. Teaching staff who are “architects” for education and training innovation is the central manpower resource and determinant to the College’s training quality. With no superb teachers come no superb students. Fully aware of that, the College has taken various measures to standardize its lecturers’ pedagogical, IT, and foreign language capabilities while incentivizing them to be sufficiently self-aware to independently study and cultivate their moral virtues, thereby gradually boosting the College’s quantitative and qualitative contingent of teaching staff, meeting task requirements for training and scientific research. At present, 100% of the College’s lecturers underwent university education of which over 60% underwent postgraduate education; over 20% of its lecturers teach their majors in English; 100% of its lecturers achieved standards of IT and foreign language levels. They are also devoted to their career and have steadfast political willpower, pure ethics and lifestyle; ample capability and experience in training and scientific research; and exemplary pedagogical approach and style. Many of them genuinely set an example to their generations of cadets as regards brainpower, talent and moral and lifestyle virtues. In response to the cause of building and defending the Homeland in the new situation, the robust development of science and technology and the policy on modernization of the Signal Corps necessitates the College continuously making a breakthrough in innovating its quantitative and qualitative pool of teaching staff in a bid to meet the requirements for high-end manpower resources to the national industrialization and modernization. Since 2017, in addition to signal staff officer cadet training, the College has officially been tasked with training cyber warfare commanding officers while swiftly finalizing the project preparatory to signal officer training whose majors encompass infantry, air force and air defence, and naval signal staff commanding. Besides, the Ministry of National Defence gave the College the go-ahead to develop the second phase of the project of building the Centre for IT and foreign languages. To fulfil those tasks, the College has always been fully aware of the role of its teaching staff as a determinant to education and training reform and quality which enable the College to become a genuine cradle of training signal cadres and officers who will make the modernization of the Signal Corps possible. Grounded in enhancing the quality of teaching staff as the core and breakthrough stage in the College’s development strategy, party executive committees, offices, and units have counselled and proposed effective solutions for building and developing a contingent of teaching staff on their own responsibility while resolutely avoiding underplaying or overplaying the role of lecturers. Accordingly, the College has properly taken some measures as follows. First, properly implementing the work of planning and training to enhance the overall quality of teaching staff. The College’s Party executive committee has proactively executed the work of qualitative teaching staff planning in close alignment with training and utilization schedules as a basis for immediate and long-term objectives. Great importance is attached to forging political dignity and work ethics for teaching staff while attention is paid to developing a key pool of lecturers with master’s and doctoral degrees, and cultivating a contingent of young virtuous and capable teaching staff. In addition, it is crucial to proactively recommend higher authorities’ to detach capable and experienced cadres at signal units to the College for training mission. The vigorous development of science and technology in general and military science in particular as well as the modernization of the Signal Corps necessitate the College promoting inclusive quality for teaching staff with emphasis on diversifying forms of training via the combination of regular and focused training and in-service and short-term one, and on training lecturers with in-depth professionalism and creative thinking skills. Simultaneously, the role of the Centre for IT and foreign languages should be strengthened in standardizing foreign language and IT levels and fostering quality of scientific research for teaching staff. Additionally, practical knowledge and skills can be acquired by means of job rotation and deeper cooperation with military and non-military educational institutions of excellence. By 2020, the College will meet a target of standardizing its contingent of teaching staff, of which 90% undergo postgraduate education and 30% possess doctorate degrees. Second, promoting the role of party executive committees and commandants at various levels to manage, assess and utilize teaching staff. Accordingly, on the one hand, growing importance is attached to combining the work of cadre assessment with the performance of teaching staff’s duties and responsibilities in a procedural, democratic and objective fashion. On the other, the College has enabled its teaching staff to strive for stated norms, regarding the performance of teaching task, scientific research, working efficiency, and credibility among colleagues and students as a criterion for cadre planning and assessment. It is necessary to boost the work of inspection and supervision towards teaching staff’s duties and responsibilities in a bid to set forth appropriate solutions to every specific situation. Party organizations at all levels need to regularly strengthen the work of political and ideological education, and enhance a sense of responsibility for teaching task and scientific research amongst teaching staff in an active, proactive, and creative manner while redressing manifestations of egalitarian attitude and passivity in independent study and cultivation of moral and lifestyle virtues. Third, due regard is paid to building wholesome military pedagogical environment for teaching staff’s development and contribution. Great importance is attached to promoting a greater sense of unity among offices, units and faculties, ensuring equality, democracy and transparency in training and education, thereby enabling teaching staff to devote themselves to their career. Policies for teaching staff should be properly implemented with a focus on providing physical and mental assistance for lecturers with outstanding teaching efficiency and substantial contributions to the College’s construction. Regulations on registering, selecting, recognizing grassroots and Ministry of Defence-level distinctions of superb teacher; those on signing up for professorial and associate professorial candidates and other relevant titles should be carried out in a procedural fashion. Due attention is paid to improving teaching staff’s living standards so that they are able to dedicate themselves to their career. 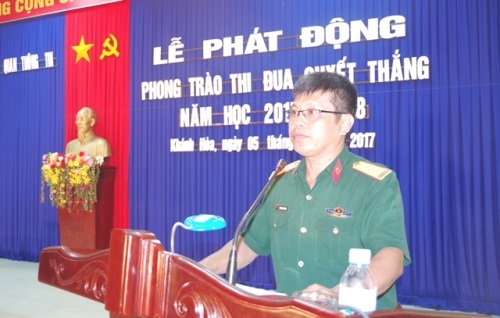 Grounded in continued comprehension and implementation of the Party and Army’s resolutions and directions on education and training, the College successfully executed “development strategy for Telecommunications University in the 2013-2020 period and a vision towards 2030” under the key motto “Knowledge - Morality – Creativity - Dynamism - Integration”. Given attained results, the College’s cadres, lecturers, cadets, military workers, and soldiers have made a concerted effort to steer its construction and development to “standardization, modernization, democratization and proactive international integration”, preserving its status as a powerhouse for national and military education and training, and scientific research.